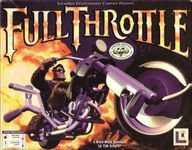 "Full Throttle is a computer adventure game developed and published by LucasArts. It was designed by Tim Schafer, who would later go on to design the critically acclaimed titles Grim Fandango, Psychonauts and Brutal Legend. The game features voice actors Roy Conrad and Mark Hamill. It was released on April 30, 1995. It is the tenth game to use the SCUMM adventure game engine." Source: Wikipedia, "Full_Throttle_(1995_video_game)," available under the CC-BY-SA License.